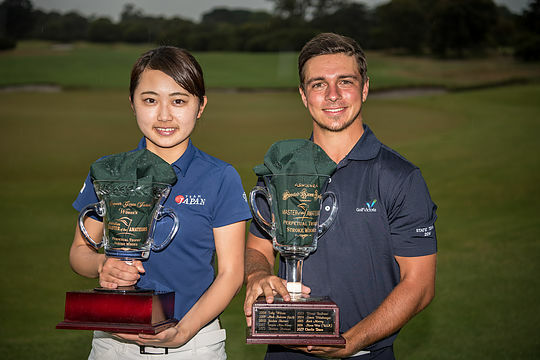 Japan’s Yuka Yasuda and Australian David Micheluzzi have taken the Australian Master of the Amateurs titles in stunning fashion at The Royal Melbourne Golf Club. Yasuda, 17, took a six stroke lead into the final round after her record breaking third round 65 on The East course and a final round 73 gave her a five stroke victory at 3-over-par from second round leader Australia’s Julienne Soo who finished at 8-over-par, with Queenslander Robyn Choi a further three shots behind. The victory was Yasuda’s first international win outside Japan where she won the 2017 Japanese Amateur. “This win will be very important for my career,” said Yasuda through an interpreter. This was the first time 24 elite female golfers had joined the 78 National and International elite male amateur golfers, in a separate Championship, under the same title of the Australian Master of the Amateurs. The East Course at Royal Melbourne provided the perfect test for the field which during the tournament saw four course records being set. In the men’s championship, Micheluzzi stormed home to claim the title in convincing fashion firing rounds of 72-69-65-64 to finish at 14-under and five clear of Darcy Brereton, who held the lead for the opening two rounds and American Shintaro who fired a final round course record 63. US Amateur Junior champion, Min Woo Lee finished in 4th at 2-under-par, with American Philip Knowles rounding out the top-5 at 1-under-par. The victory adds to the Victorian Amateur Micheluzzi collected last year having earlier won the Port Phillip Amateur in 2016. “It’s great to win an event like this against such a high quality field,” said Micheluzzi. Micheluzzi really made his move during his third round 65, closing over the back nine with a string of birdies to move on local Darcy Brereton, who had opened with rounds of 66-68 to take the lead for the opening two days. “I was able to capitalise late during the third round,” said Micheluzzi. The East Course at Royal Melbourne was presented nothing short of spectacular and the field was the strongest that we will see in Australia this season by a long shot. Defending champion Charlie Dann was there to present the Green Jacket to Micheluzzi and the victory sees Micheluzzi’s name being added to a trophy which includes Jason Day, Aaron Wise, Zach Murray to name just a few.